Requirements: One or more faculty could apply for this award; the total amount will be awarded per application. No one faculty member can be awarded two years in a row. Individuals (faculty, staff, or students) can nominate a course to be awarded; that faculty member(s) will be contacted for more information on their course. 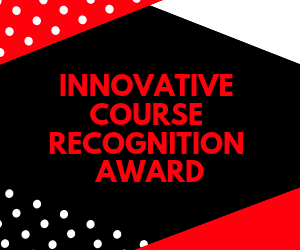 Two $500 awards and certificates will be awarded at the 2019 Conference on Teaching Innovation. The deadline for applications is May 15. Please submit using the form below.